Tennis is a very popular sport played all over the world. Wimbledon is the name of the oldest tennis competition in the world. It has been played in England since 1897. Some famous tennis players include Rafael NadaI, Serena Williams, and Roger Federer. Tennis can be played between 2 players (this is called singles) or between 4 players (this is called doubles). 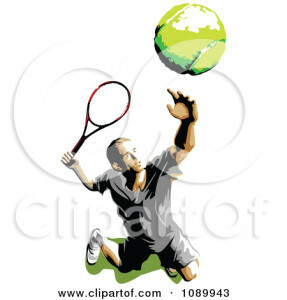 Tennis players hit a soft, bouncy ball by using a racket (racquet). A tennis match usually has 1 main judge, who is called an umpire. Sometimes there is also a line judge. 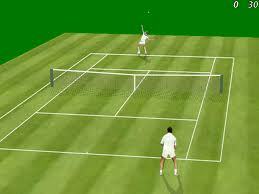 Tennis is played on a rectangular court, usually with a grass, clay, or hard court surface. The court is about 24 meters long and 8 meters wide. In the middle of the court is a net, which is usually just under 1 meter high. Players must hit a ball over the net, from one player’s side to the other player’s side of the court. The ball must bounce just once in each player’s side of the court. A tennis match consists of 3 or 5 sets, depending on the competition. Women usually play 3 sets, while men usually play 5 sets. A set consists of a number of games. The set is usually complete when 1 player wins 6 games and the other player has less than 5 games. Sometimes a set continues until one player has won 7 games. In a match of 3 sets, one player must win at least 2 sets. In a match of 5 sets, one player must win at least 3 sets. Play begins with one player (A) serving the ball from one side of the back of the court into the service box diagonally opposite where another player (B) is standing. If the serve is good, the receiver (player B) must hit it back into the server’s (player A) side of the court. This is called “returning serve”. Play continues until one player cannot return a shot, or hits a shot out of the court, and loses the point. The server (player A) then serves again, and play continues until one player scores enough points to win the first game. The second game begins, and now it is the chance for player B to serve. At the end of each game, a different player will serve. The set continues until one player wins 6 or 7 games. 1. Tennis is played on a circular court. 2. Wimbledon is a tennis competition played in England. 3. There can be 3 sets or 5 in a tennis match. 4. The main judge of a tennis match is called a referee. 5.Tennis can be played by 6 players at one time. 6. The player who starts the game is called the server. 7. When player A has won 6 games and player B has won 2 games, the set is complete. 1. What is the name of the place on which tennis is played? 2. What do you call it when 4 players are playing on the court at the same time? 3. How high is the net over which the ball must be hit? 4. Which of these shapes is most like a tennis court? various verbs are used in tennis for a range of actions such as serving; making strokes; scoring points and sometimes, making mistakes. He serves the ball very fast. I returned his serve, even though it was very fast. It is a big advantage to break your opponent’s service. She scored many points from my slow serves. She made many good ground strokes in that set. You need to toss the ball high, to make a good serve. When he came to the net, I lobbed the ball over his head into the back of the court. When you slice the ball, it spins back toward you. Usually you are near to the net when you slice the ball. We usually smash the ball when we are close to the net. We volley by hitting the ball in the air before the ball bounces. She commited a double fault by serving two bad serves. You can visit the English Club website for more tennis information and vocabulary. Some players use mainly their right hand to play; while others use mainly their left hand. For example, Viktoria Azarenka (from Belarus) is a right-handed player; while Spaniard Rafael Nadal is left-handed. Some players are taller and stronger and naturally can use more power in their games. American John Isner is 2.08 meters tall and serves many many aces. Some players use both hands for certain strokes. For example, China’s Li Na uses a two handed back hand stroke. What about you? Which is your dominant hand? Do you ever use two hands while playing strokes? Baseliners stay at the baseline and usually have especially strong forehand or backhand strokes. These types of players try to control the game by moving their opponents around the court. Serbian Novak Djokovic, American Serena Williams and Russian Maria Sharapova are aggressive baseline players. The serve and volley player will usually attack the net straight after they have served. Usually these players don’t like long rallies. There are not so many famous serve and volley players anymore. Czech player Radek Stepanek and Italian Roberta Vinci are two such players. This type of player concentrates on defensive strokes and making very few errors. These players usually have great speed and fitness. British tennis player Andy Murray and Caroline Wozniacki of Denmark are excellent counter punch players. This type of player can play a wide range of styles and shots. They can change their way of playing to suit any type of opponent. Swiss champion Roger Federer and Czech player Petra Kvitova are famous all court players. What type of player would you like to be? Do you have a favourite tennis player? What style do you think will suit you best? This entry was posted in Reading, Speaking by Denver. Bookmark the permalink.